Live on STV, Lorraine Kelly has revealed the fantastic total of £2,610,427 raised for the STV Appeal 2014. 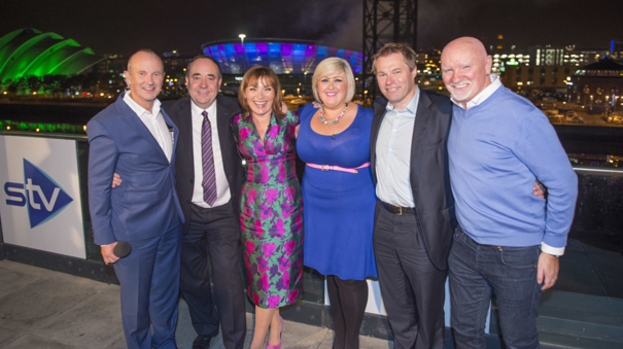 The big finale of this year’s STV Appeal, STV Appeal 2014 – The Big Live, brought together celebrities and fundraisers who have made the STV Appeal 2014 an overwhelming success. Hosted by Lorraine Kelly from STV’s Pacific Quay studios in Glasgow, the programme was packed with live entertainment including music from Nicholas McDonald, celebrity appearances by Des Clarke and Team Scotland, and inspiring fundraising stories from across the country. Co-presenter Michelle McManus and Fred MacAuley joined Lorraine in Glasgow, with Sean Batty from RBS Gogarburn in Edinburgh, links to Andrea Brymer at Codonas in Aberdeen, and Nicola McAlley in Inverness. Lorraine also made a surprise appearance on stage at the SSE Hydro in Glasgow during Still Game where Jack and Victor got the audience on their feet to text the STV Appeal, raising over £10,000. Cheques from a range of fantastic STV Appeal fundraising challenges, including freshnlo Pedal for Scotland, Lorraine Kelly’s Shimmy across Scotland and Sean Batty’s Highland Fling, were presented across the country with Lorraine bringing the evening to a close by revealing the total sum raised for this year’s STV Appeal. The STV Appeal raises money for children and young people affected by poverty in Scotland. Lorraine Kelly, presenter and STV Appeal trustee, said: "It has been a fantastic evening here at STV and the perfect way to celebrate the fundraising efforts of this year's STV Appeal. The incredible amount of money raised tonight and throughout the campaign will make a real difference to the lives of children and young people affected by poverty in Scotland. A huge thanks to everyone who has given generously to this hugely important cause. There is still time to donate for the STV Appeal, so please keep giving!" Sir Tom Hunter, STV Appeal trustee, said: "Central to the referendum debate was the issue of social justice and poverty. Once again Scots have backed the STV Appeal brilliantly in the full knowledge that every penny raised up to the first one million pounds is doubled by the Scottish Government and then channelled to support young people challenged by poverty and social justice. Not one penny goes to administration; every last penny goes to helping those most in need. Congratulations to everyone who supported the STV Appeal it’s a fantastic effort from all across Scotland and makes me hugely proud to have co-founded the Appeal." Garreth Wood, Trustee of The Wood Foundation, said: “The hard work, commitment and generosity from individuals, communities and businesses means that this fantastic total will go a long way towards helping tackle the poverty crisis facing too many of Scotland’s children. To think that one in five children in Scotland today are living in poverty, families struggling to meet their basic needs, is a particularly difficult statistic to accept and one that, together, we can work to change. Rob Woodward, chief executive of STV, said: “2014 has been an incredible year for the STV Appeal and we have seen some fantastic support from fundraisers all over the country, with everything from charity concerts and quiz nights to bag packing and bake sales taking place to raise money and awareness for children affected by poverty in Scotland. STV Appeal is a Scottish Charitable Incorporated Organisation, number SC042429. What do you think? Please Sign in or Join to leave a comment. Check-out our House Rules so that we can all make this a better experience for everyone.